Reminiscent of the bestsellers of Laura Lippman and Harlan Coben--with a dose of Big Little Lies or Stranger Things--an absorbing, addictive tale of psychological suspense from the author of the highly acclaimed and Edgar Award-nominated What Remains of Me and the USA Today bestselling and Shamus Award-winning Brenna Spector series, in which a seemingly open-and-shut police case with a clear-cut hero and villain turns out to be anything but simple. Late one night in the quiet Hudson Valley town of Havenkill, a distraught woman stumbles into the police station--and lives are changed forever. Aimee En, once a darling of the '80s pop music scene, claims that a teenage boy stole her car, then ran over another young man who'd rushed to help. As Liam Miller's life hangs in the balance, the events of that fateful night begin to come into focus. But is everything as it seems? 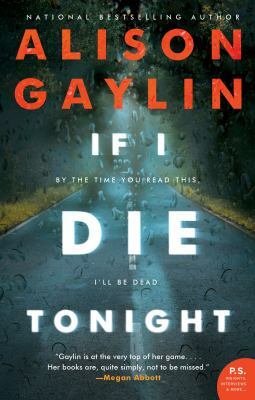 Told from a kaleidoscope of viewpoints--Wade's mother Jackie, his younger brother Connor, Aimee En and Pearl Maze, a young police officer with a tragic past, If I Die Tonight is a story of family ties and dark secrets--and the lengths we'll go to protect ourselves.